Get Tech Wizard Iron Man! Iron Man: I'm gonna show Doctor Strange that science is better than magic. Captain America: Can it wait until after the invasion is over? Iron Man: Nope. This guy tried to disrespect my super-scientist lifestyle. I have to prove tech is better while making magic look stupid. Captain America: When you do stuff like this, you usually make yourself look stupid. Iron Man: Iron Man's gotta do what Iron Man's gotta do. Tech Wizard Iron Man: Behold the Wizard Wonderful! I'm like the Sorcerer Supreme, but with a stick and better beard! Tech Wizard Iron Man: I'm actually really busy. I just prioritize petty rivalries over important responsibilities. Doctor Strange: Why is your cloak glowing? Tech Wizard Iron Man: Science! I've been working on clothing that mimics some of the functionality of my armor. I look like an elderly magician, but actually have the functionality of a weaponized supercomputer. Doctor Strange: And you really think a pointy hat and a computer cloak makes you some kind of sorcerer? 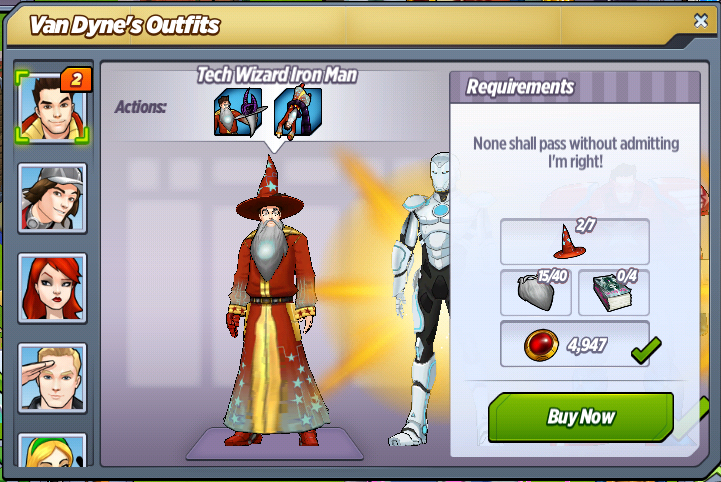 Tech Wizard Iron Man: Of course not. I also need to wave my hands around while yelling lots of nonsensical words. Doctor Strange: If you really think you're a technological sorcerer now, why don't you capture some of the creatures that escaped from the Dark Dimension? I'm sure this is a problem science can solve. Tech Wizard Iron Man: YOU SHALL NOT PASS! Doctor Strange: I actually need to get by to help with Kaecilius and his Zealots. Doctor Strange: Yeah, I get it. Good one. Doctor Strange: How was your first taste of magic? Tech Wizard Iron Man: If I could, I would've spit it out. Doctor Strange: You look hurt. Are you hurt? I mean, not just emotionally, but physically. I can help. I'm a doctor. Tech Wizard Iron Man: I'm fine. Being crotchety is part of my old wizard shtick. Doctor Strange: Your rib is broken. Tech Wizard Iron Man: Your scarf is lame. Black Widow: I like the beard. Tech Wizard Iron Man: You do?! Black Widow: Yeah. I don't have to see so much of your face. Tech Wizard Iron Man: You're the funniest Russian spy I know. How can I trap one of these Dark Dimension creatures? Black Widow: Do I look like a sorcerer to you? Tech Wizard Iron Man: I have an extra wizard beard. Black Widow: That's the dumbest sentence I've ever heard. Tech Wizard Iron Man: I tried to tweak the cloak tech to electrify the tentacles. Black Widow: It didn't work. Tech Wizard Iron Man: When did you become so snarky? I blame myself. Doctor Strange: Would you like some help? Tech Wizard Iron Man: Never. Doctor Strange: Then here's some advice to ignore. Dark Dimension creatures are attracted to shadows. They'll be easier to trap by coaxing them into someplace spacious and dark. 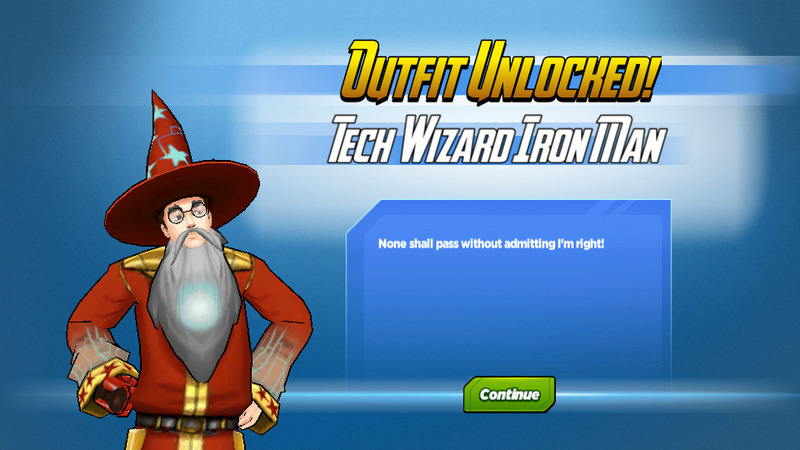 Tech Wizard Iron Man: Like the inside of my ridiculous wizard hat! Tech Wizard Iron Man: ABRACADABRA! Tech Wizard Iron Man: Because it's so dumb. Doctor Strange: They say that any sufficiently advanced technology is indistinguishable from magic. Tech Wizard Iron Man: Do you believe that? Tech Wizard Iron Man: Magical science bros! Doctor Strange: Careful with the spellcasting fingers. What do you think of Tech Wizard Iron Man? Have you created this outfit yet?